We have moved the final preorder date up from June 15th to June 12th. 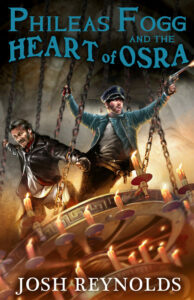 In order to have your name appear on the acknowledgments page of Phileas Fogg and the Heart of Osra by Josh Reynolds, you must preorder no later than Sunday June 12th. This is so we can coordinate printing the books, meeting up with Josh to sign them, then shipping them from the UK to the US in time for FarmerCon. Also, don’t forget the deadline to preorder Blood of Ancient Opar by Christopher Paul Carey—and have your name appear on the acknowledgements page—is Wednesday June 15th. And while we’re not publishing preorderers names in the hardcover signed limited edition of the new Dayworld novel, A Hole in Wednesday by Philip José Farmer and Danny Adams, if you want to guarantee you can get a signed copy before they sell out, you also need to preorder no later than June 15th. And while they are not signed limited editions, if you want to get a signed copy of Crossovers Expanded, Volumes 1 & 2, by Sean Lee Levin . . . you get the idea, preorder now! FarmerCon is now just over six weeks away!